Based on the closing sales price of $27.91 per share as of June 30, 2015, the aggregate market value of the voting and non-voting common equity of the Registrant held by non-affiliates was approximately $1,936.4 million. Documents Incorporated by Reference - Portions of our definitive Proxy Statement relating to our 2016 Annual Meeting of Shareholders are incorporated by reference into Part III of this Form 10-K. We anticipate that our Proxy Statement will be filed with the Securities and Exchange Commission within 120 days after the end of our fiscal year ended December 31, 2015.
the impact of MVPD’s offering “skinny” programming bundles that may not include television broadcast stations. the results of prior year tax audits by taxing authorities. Other matters set forth in this report and other reports filed with the Securities and Exchange Commission (SEC), including the Risk Factors set forth in Item 1A of this report may also cause actual results in the future to differ materially from those described in the forward-looking statements. However, additional factors and risks not currently known to us or that we currently deem immaterial may also cause actual results in the future to differ materially from those described in the forward-looking statements. You are cautioned not to place undue reliance on any forward-looking statements, which speak only as of the date on which they are made. We undertake no obligation to update or revise any forward-looking statements, whether as a result of new information, future events or otherwise. In light of these risks, uncertainties and assumptions, events described in the forward-looking statements discussed in this report might not occur. We are a diversified television broadcasting company with national reach with a strong focus on providing high-quality content on our local television stations and digital platforms. The content, distributed through our broadcast platform, consists of programming provided by third-party networks and syndicators, local news, and other original programming produced by us. We also distribute our original programming, and owned and operated network affiliates, on other third-party platforms. Additionally, we own digital media products that are complementary to our extensive portfolio of television station related digital properties. Outside of our media related businesses, we operate technical services companies focused on supply and maintenance of broadcast transmission systems as well as research and development for the advancement of broadcast technology, and we manage other non-media related investments. As of December 31, 2015, our broadcast distribution platform is a single reportable segment for accounting purposes. It consists primarily of our broadcast television stations, which we own, provide programming and operating services pursuant to local marketing agreements (LMAs), or provide sales services and other non-programming operating services pursuant to other outsourcing agreements (such as JSAs and SSAs) to 163 stations in 79 markets. These stations broadcast 444 channels, including 215 channels affiliated with primary networks or program service providers comprised of: FOX (47), ABC (32), CBS (29), NBC (23), CW (44), MyNetworkTV (MNT) (34), and Univision (6). The other 229 channels broadcast programming from Antenna TV, American Sports Network (ASN), Azteca, Bounce Network, COMET, Decades, Estrella TV, Get TV, Grit, Heartland, Me TV, MundoFox, Retro TV, Telemundo, This TV, News & Weather, Zuus Country, and one channel broadcasts independent programming. For the purpose of this report, these channels are referred to as “our” stations. Refer to our Television Markets and Stations table later in this Item 1. for more information. Our broadcast segment provides free over-the-air programming to television viewing audiences in the communities we serve through our local television stations. The programming that we provide on our primary channels consists of network provided programs, locally-produced news, local sporting events, programming from program service arrangements, syndicated entertainment programs, and internally originated programming provided by our other media subsidiaries. We provide live local sporting events on many of our stations by acquiring the local television broadcast rights for these events. Additionally, we purchase and barter for popular syndicated programming from third party television producers. We are the nation's largest producer of local news. We produce approximately 2,200 hours of news per week at 106 stations in 77 markets, including one station which produces news pursuant to a local news sharing arrangement for a competitive station in that market. We have 20 stations which have local news sharing arrangements with a competitive station in that market that produces the news aired on our station. See Operating Strategy later in this Item 1. for more information regarding the news and programming we provide. Our primary source of revenue is the sale of commercial inventory on our television stations to our advertising customers. We also earn revenues by providing digital content to non-linear devices via websites, mobile, and social media advertisements as well as bundling digital advertisements with traditional commercial inventory on our television stations. Our objective is to meet the needs of our advertising customers by delivering significant audiences in key demographics. Our strategy is to achieve this objective by providing quality local news programming, popular network, syndicated and live sports programs, and other original content to our viewing audience. We attract most of our national television advertisers through national marketing representation firms which have offices in New York City, Los Angeles, Chicago and Atlanta. Our local television advertisers are attracted through the use of a local sales force at each of our television stations, which is comprised of approximately 750 sales account executives and 110 local sales managers company-wide. We also earn revenue from our retransmission consent agreements through payments from multichannel video programming distributors ("MVPDs") in our markets. The MVPDs are local cable companies, satellite television and local telecommunication video providers. The revenues primarily represent payments from the MVPDs for access to our broadcast signal and are typically based on the number of subscribers they have. there has been a significant difference in our operating results when comparing even-numbered years’ performance to the odd numbered years’ performance. Additionally, our operating results are impacted by the number and importance of individual political races and issues discussed on a national level as well as those within the local communities we serve. We believe political advertising will continue to be a strong advertising category in our industry. With increased spending by Political Action Committees (PACs), including so-called Super PACs, and as political-activism around social, political, economic and environmental causes continues to draw attention, political advertising levels may increase further. We own and operate various networks carried on our distribution platforms: ASN, our regional sports network launched in 2014, and COMET, our science fiction multicast network which debuted in October 2015. Also, in January 2016, we announced the acquisition of Tennis Channel, a cable network which includes coverage of the top 100 tournaments and original professional sport and tennis lifestyle shows. We anticipate the acquisition of Tennis Channel to be completed in the first quarter of 2016. Our internally developed content includes Ring of Honor ("ROH"), our professional wrestling promotion, Full Measure with Sharyl Attkinsson ("Full Measure"), our national Sunday morning investigative and political analysis program, launched in October 2015, and our joint venture with Tornante Company which is currently developing low-cost syndicated court, game, comedy, and talk shows. We also earn revenues from Sinclair Digital Solutions, a full service digital agency which uses our digital expertise to help businesses run multi-platform digital marketing campaigns, and navigate and compete in a world of constant innovation and changes in consumer behavior. During 2015, we launched Sinclair Digital Ventures which focuses on the investment in emerging digital technologies and digital content companies that support and expand Sinclair's digital capabilities and non-linear footprint. In April 2016, we will re-launch Circa, a national online digital news operation aimed at the younger demographic. We own subsidiaries which are dedicated to providing broadcast related technical services to the broadcast industry including: Acrodyne Technical Services, a provider of service and support for broadcast transmitters throughout the world; Dielectric, a designer and manufacturer of broadcast systems including all components from transmitter output to antenna; and ONE Media, a technology innovator at the forefront of developing industry standards and related technologies for Next Generation Broadcast Platforms (Next Gen) encompassing its flexible and enhanced vision for broadcasting. We own various non-media related investments through our subsidiary Keyser Capital which is an originator, underwriter, and manager of our investments across multiple asset classes including private equity, mezzanine financing, and real estate investments. Some of the largest investments include: Triangle Sign and Service (Triangle), a sign designer and fabricator; Alarm Funding Associates (Alarm Funding), a regional security alarm operator and bulk acquisition company; Bay Creek South (Bay Creek), a land developer for a planned resort community in Cape Charles, VA; and Jefferson Place, a mixed use land development project in Frederick, MD. We are a Maryland corporation formed in 1986. Our principal offices are located at 10706 Beaver Dam Road, Hunt Valley, Maryland 21030. Our telephone number is (410) 568-1500 and our website address is www.sbgi.net. The information contained on, or accessible through, our website is not part of this annual report on Form 10-K and is not incorporated herein by reference. Rankings are based on the relative size of a station’s Designated Market Area (DMA) among the 210 generally recognized DMAs in the United States as estimated by Nielsen as of September 2015. We have a total of 12 other low powered stations, in certain markets which expand our signal by simulcasting our content throughout the market. When we negotiate the terms of our network affiliations or program service arrangements, we negotiate on behalf of all of our stations affiliated with that entity simultaneously. This results in substantially similar terms for our stations, including the expiration date of the network affiliations or program service arrangements. If the affiliation agreement expires, we may continue to operate under the existing affiliation agreement on a temporary basis while we negotiate a new affiliation agreement. ASN became a 24/7 sports network in January 2016 and is currently carried in 15 markets. The license assets for these stations are currently owned by third parties. We provide programming, sales, operational and administrative services to these stations pursuant to certain service agreements, such as LMAs. The license and programming assets for these stations are currently owned by third parties. We provide certain non-programming related sales, operational and administrative services to these stations pursuant to service agreements, such as joint sales and shared services agreements. The license and programming assets for this station is currently owned by us. A third party provides certain non-programming related sales, operational and administrative services to this station pursuant to service agreements, such as joint sales and shared services agreements. We provide programming, sales, operational, and administrative services to this station, of which 50% is owned by a third party. Programming to Attract Viewership. We seek to target our programming offerings to attract viewership, to meet the needs of the communities in which we serve and to meet the needs of our advertising customers. In pursuit of this strategy, we seek to develop original programming or obtain, at attractive prices, popular syndicated programming that is complementary to each station’s network programming. We also seek to broadcast live local and national sporting events that would appeal to a large segment of the local community. See Popular Sporting Events below for further discussion. Moreover, we produce local news at 106 stations in 77 markets, including one station which has a local news sharing agreement with a competitive station in that market. See Local News below for further discussion. Television advertising prices are primarily based on ratings information measured and distributed by Nielsen. Nielsen is currently not accredited by the Media Rating Council, an independent organization that monitors rating services, which revoked Nielsen’s accreditation in the 154 markets in which Nielsen measures ratings exclusively by its diary methodology. As of December 31, 2015, approximately 52 of our 79 markets are diary only markets. We entered into a contract with Rentrak Corporation, an alternative rating service provider that uses set-top box television measurements to provide us additional measurement information to the ratings services that Nielsen provides for all 163 of our stations in our 79 markets. Local News. We believe that the production and broadcasting of local news is an important link to the community and an aid to a station’s efforts to expand its viewership. In addition, local news programming can provide access to advertising sources targeted specifically to local news viewers. Our news stations also produce content on digital platforms such as websites, applications, and social media. During 2015, we expanded news in 16 markets and plan to add additional newscasts in 7 markets in 2016. During the year ended December 31, 2015, 29.6% of our net time sales were earned during the local news we produce each week. Our local news initiatives are an important part of our strategy that have resulted in our entering into 21 local news sharing arrangements with other television broadcasters. We are the provider of news services for 1 market, while in 20 of our news share arrangements we are the recipient of services. We believe that, in the markets where we have news share arrangements, such arrangements generally provide both higher viewer ratings and revenues for the station receiving the news and generate a profit for the news share provider. Generally, both parties and the local community are beneficiaries of these arrangements. In addition to our traditional local news stories, we have utilized our national reach and placement in the nation's capital to provide our local viewers with broader national news stories which are relevant to our local viewers. In January 2015, we launched a national news desk and a Capitol Hill bureau. These news teams produce daily unique stories unavailable from other sources and focused on government accountability storytelling that provides a significant point of difference for our stations. Available on-air and online, the bureau not only expands our news presence, but gives our local station viewers an opportunity to hear the views of their members of Congress through programs such as "Connect to Congress, " our weekly on-air and digital feature which provides an electronic video pathway for lawmakers to speak to their constituents. Popular Sporting Events. At some of our stations, we have been able to acquire local television broadcast rights for certain sporting events, including NBA basketball, MLB, NFL football, NHL hockey, ACC basketball and both Big Ten and SEC football and basketball and certain other college and high school sports. Our CW and MyNetworkTV stations generally face fewer preemption restrictions on broadcasting live local sporting events compared with our FOX, ABC, CBS and NBC stations, which are required to broadcast a greater number of hours of programming supplied by the networks. In addition, our stations that are affiliated with FOX, ABC, CBS and NBC have network arrangements to broadcast certain NBA basketball games, MLB baseball games, NFL football games, NHL hockey games, NASCAR races and PGA golf events, as well as other popular sporting events. Our stations also broadcast programming provided by ASN. See Development of Original Networks and Content below for the discussion related to the operating strategy of ASN. Control of Operating and Programming Costs. By employing a disciplined approach to managing programming acquisition and other costs, we have been able to achieve operating margins that we believe are very competitive within the television broadcast industry. We believe our national reach as of December 31, 2015 of over 37.4% of the country provides us with a strong position to negotiate with programming providers and, as a result, the opportunity to purchase high quality programming at more favorable prices. Moreover, we emphasize control of each of our station’s programming and operating costs through program-specific profit analysis, detailed budgeting, regionalization of staff and detailed long-term planning models. We also control our programming cost by creating original high-quality programming that is distributed on our broadcast platform. This original programming includes our ASN and COMET networks, and ROH and Full Measure programs. Developing Local Franchises. We believe the greatest opportunity for a sustainable and growing customer base lies within our local communities. Therefore, we have focused on developing a strong local sales force at each of our television stations, which is comprised of approximately 750 sales account executives and 110 local sales managers company-wide. Excluding political advertising revenue, retransmission revenues, and other local revenues, 71.5% and 71.9% of our same station net time sales were local for the years ended December 31, 2015 and 2014 respectively. Market share survey results reflect that our stations' share of the local television advertising market increased to 25.2% in 2015 from 23.8% in 2014. Our goal is to grow our local revenues by increasing our market share and by developing new business opportunities. Attract and Retain High Quality Management. We believe that much of our success is due to our ability to attract and retain highly skilled and motivated managers at both the corporate and local station levels. We provide a combination of base salary, long-term incentive compensation including equity awards and, where appropriate, cash bonus pay designed to be competitive with comparable employers in the television broadcast industry. A significant portion of the compensation available to certain members of our senior management and our sales force is based on their achievement of certain performance goals. We also encourage station managers and employees to utilize our diverse station group to grow in their careers while remaining in the Sinclair family of stations via internal promotion and relocation. Multi-Channel Broadcasting. FCC rules allow broadcasters to transmit additional digital channels within the spectrum allocated to each FCC license holder. This provides viewers with additional programming alternatives such as COMET, Grit, and Get TV, at no additional cost to them. We may consider other alternative programming formats that we could air using our multi-channel digital spectrum space with the goal towards achieving higher profits and community service. As of December 31, 2015, we have 281 multi-channels in our digital spectrum. Retransmission Consent Agreements. We have retransmission consent agreements with MVPDs, such as cable, satellite and telecommunications operators in our markets. MVPDs compensate us for the right to retransmit our broadcast signals. Our successful negotiations with MVPDs have created agreements that now produce meaningful sustainable revenue streams. Improvement and maintenance of our distribution platforms. We continue to improve and maintain a strong distribution platform that consists of our traditional broadcast network and our digital platforms. Our Acrodyne and Dielectric subsidiaries are leaders in servicing and manufacturing broadcast infrastructure. As a result we maintain a strong infrastructure through which we provide high quality uninterrupted content on our broadcast stations. Developing New Business. We are always striving to develop new business models to complement or enhance our traditional television broadcast business. We have developed new ways to bundle online, mobile text messaging and social media advertising with our traditional commercial broadcasting model. Additionally, we continue to leverage our national reach to provide new high quality content to our local communities. We continue to expand our digital distribution platforms through initiatives such as our new video management system, which simplifies and automates our broadcast-to-digital streaming workflow and allows for dynamic replacement of broadcast ads with digital ads targeted to each individual viewer. By using a single ad-serving system across all of our web sites, mobile apps and other digital assets, we are able to streamline our sales workflow, optimize yield and deliver comprehensive sales opportunities across our digital footprint. Additionally, we are deploying over-the-top initiatives (OTT), such as the NewsOn app, as well as our own content applications. Strategic Realignment of Station Portfolio. We routinely review and conduct investigations of potential television station acquisitions, dispositions and station swaps. At any given time, we may be in discussions with one or more television station owners. Development of Original Networks and Content. We seek to expand our sports broadcasting in DMAs as profitable opportunities arise. During 2014, we launched ASN on a number of our MyNet, CW and multi-cast channels. ASN became a 24/7 sports network in January 2016 and is currently carried in 15 markets which we plan to expand as we build a regional strategy with a national reach. ASN has entered into multi-year comprehensive sports rights agreements with a number of distinguished NCAA Division I conferences including Conference USA, the Colonial Athletic Association, Mid-Atlantic Athletic Conference, Ivy League, and American Athletic Conference . In addition to its college initiative, ASN produces local high school sports under the “Thursday Night Lights” and “Friday Night Rivals” brands. Also in 2016, ASN entered into a 2-year agreement to broadcast the regular and post season games of Major League Football, a new professional spring-football league scheduled to kick off in 2016. Likewise, in October 2015, we led the market in launching the first-ever science fiction multicast network, COMET, featuring over 1,500 hours of premium MGM content and already reaching approximately 70 million households with more coverage expected. We entered into a joint venture with Tornante Company to develop low-cost syndicated court, game, comedy and talk shows. These are shows that have predictable audiences and genres that do well on our television stations. In early 2016, we announced the acquisition of Tennis Channel. Unlike fully distributed cable networks that are in a declining business, Tennis Channel, with its live tournaments and matches, passionate fan base and established brand, is vastly under-distributed. With the support of Sinclair and our relationships with the multi-video program distributors (MVPDs), we have been successful in negotiating significant increases in carriage with MVPDs, with more penetration expected. Among the many benefits of the expanded carriage and pairing their content with our broadcast promotional capabilities, are additional MVPD subscriber fees, viewers, and advertising revenues. Expansion of digital and internet. We announced the re-launch of Circa, a national online digital news operation aimed at the Millennial demographic. The site will focus on issues trending from around the country, delivered in an independent-minded style, with a heavy focus on short and long form video, optimized for mobile and social media engagement. In addition to its unique stories, news talent and creativity, Circa will have the added benefit of capitalizing on our broadcast branding and promotional platform to drive viewing impressions, an opportunity not available to other online news providers. Circa is expected to launch in April 2016. We have leveraged our digital expertise by launching Sinclair Digital Solutions through which we run effective, integrated, and multi-platform digital marketing programs that drive loyalty, engage consumers and help businesses achieve their goals. These innovative products and extension of our core broadcast business allow us to compete for Internet, network, and print impressions and revenues. We continue to seek additional opportunities to invest in emerging digital technologies and digital content companies that support and expand Sinclair's digital capabilities and non-linear footprint. Development of Next Generation Broadcast Platforms (Next Gen). ONE Media has developed, successfully demonstrated, and received approval for inclusion in the ATSC 3.0 transmission standard, the critical signaling and framing technology that is core to building Next Gen. Advanced Television Systems Committee standard 3.0 (ATSC 3.0) is an enhancement to the current broadcast standard and provides for increased data bits that are mobile, universal and Internet Protocol (IP) based. Next Gen provides a common IP pipe for broadband and broadcast convergence and compelling hybrid functionality; a way to make the broadcast platform an integral piece in the much broader wireless ecosystem. In addition, it opens opportunities to deliver enhanced core television services such as higher quality 4K “Ultra High Definition” video and immersive “3D Audio” sound, as well as the entire range of targeted advertising, personalized content delivery, and data collection and measurement. Additionally, Next Gen will allow us to deploy multiple new business opportunities. This could include partnerships with video and audio programming and other datacasting services, content delivery networks seeking to expand “edge” services, and other users seeking alternatives for regional and national content distribution. Other Non-media Investments. We have sought ways to diversify our business and return additional value to our shareholders through investments in non-media based businesses and real estate. We carry investments in various companies from different industries including sign design and fabrication and security alarm monitoring and bulk acquisition. In addition, we invest in various real estate ventures including developmental land, operating commercial and multi-family residential real estate properties and apartments. We also invest in private equity and structured debt / mezzanine financing investment funds. Currently, operating results from our investments represent a small portion of our overall operating results. The ownership, operation and sale of television stations are subject to the jurisdiction of the FCC, which acts under the authority granted by the Communications Act of 1934, as amended (the Communications Act). Among other things, the FCC assigns frequency bands for broadcasting; determines the particular frequencies, locations and operating power of stations; issues, renews, revokes and modifies station licenses; regulates equipment used by stations; adopts and implements regulations and policies that directly or indirectly affect the ownership, operation and employment practices of stations; and has the power to impose penalties for violations of its rules and regulations or the Communications Act. The following is a summary of certain provisions of the Communications Act and specific FCC regulations and policies. Reference should be made to the Communications Act, FCC rules and the public notices and rulings of the FCC for further information concerning the nature and extent of federal regulation of broadcast stations. Television stations operate pursuant to broadcasting licenses that are granted by the FCC for maximum terms of eight years and are subject to renewal upon application to the FCC. During certain periods when renewal applications are pending, petitions to deny license renewals can be filed by interested parties, including members of the public. Although historically renewal of a license, including those of the Company, is granted in the vast majority of cases, even when petitions to deny are filed, there can be no assurance that the license of any station will be renewed or, if renewed, that the renewal terms will be for the maximum term permitted. Certain of our stations have pending renewal applications that are subject to petitions to deny or informal objections. The FCC is in the process of considering these renewal applications and we believe the petitions and objections have no merit. In addition, action on many license renewal applications, including those we have filed, has been delayed because of the pendency of complaints that programming aired by the various networks contained indecent material and complaints regarding alleged violations of sponsorship identification rules. We cannot predict when the FCC will address these complaints and act on the renewal applications. We continue to have operating authority until final action is taken on our renewal applications. General. The Communications Act prohibits the assignment of a broadcast license or the transfer of control of a broadcast license without the prior approval of the FCC. In determining whether to permit the assignment or transfer of control of, or the grant or renewal of, a broadcast license, the FCC considers a number of factors pertaining to the licensee, including compliance with various rules limiting common ownership of media properties, the “character” of the licensee and those persons holding “attributable” interests in that licensee and compliance with the Communications Act’s limitations on foreign ownership. The FCC has indicated that in order to approve an assignment or transfer of a broadcast license the FCC must make an affirmative determination that the proposed transaction serves the public interest, not merely that the transaction does not violate its rules or shares factual elements with other transactions previously approved by the FCC, and that it may deny a transaction if it determines that the transaction could result in public interest harms by substantially frustrating or impairing the objectives or implementation of the Communications Act or related statutes. The FCC generally applies its ownership limits to “attributable” interests held by an individual, corporation, partnership or other association. In the case of corporations holding, or through subsidiaries controlling, broadcast licenses, the interests of officers, directors and those who, directly or indirectly, have the right to vote 5% or more of the corporation’s stock (or 20% or more of such stock in the case of insurance companies, investment companies and bank trust departments that are passive investors) are generally attributable. In addition, pursuant to what is known as the equity-debt-plus rule, a major programming supplier or same-market media entity will be an attributable owner of a station if the supplier or same-market media entity holds debt or equity, or both, in the station that is greater than 33% of the value of the station’s total debt plus equity. Further, the Communications Act generally prohibits foreign parties from having more than a 20% interest (voting or equity) in a broadcast licensee or more than a 35% interest in the parent of that licensee. Recently, the FCC has indicated that it would consider indirect foreign ownership of broadcast licenses in excess of the 25% level on a case-by-case basis. In October, 2015, the FCC adopted a Notice of Proposed Rulemaking seeking comment on among other things, proposals to (i) simplify the foreign ownership approval process for broadcast licensees, (ii) adopt a standardized filing and review process for requests to exceed the 25% benchmark and (iii) modify the methodology a licensee may use to determine compliance with the 25% benchmark. That rulemaking remains pending. Sinclair and its subsidiaries are domestic corporations, and the members of the Smith family (who together hold approximately 76.5% as of February 19, 2015 of the common voting rights of Sinclair) are all United States citizens. Our amended and restated Articles of Incorporation (the Amended Certificate) contain limitations on alien ownership and control that are substantially similar to those contained in the Communications Act. Pursuant to the Amended Certificate, we have the right to repurchase alien-owned shares at their fair market value to the extent necessary, in the judgment of the Board of Directors, to comply with the alien ownership restrictions. Radio / Television Cross-Ownership Rule. The FCC’s radio / television cross-ownership rule generally permits a party to own a combination of up to two television stations and six radio stations in the same market, depending on the number of independent media voices in the market. Newspaper / Broadcast Cross-Ownership Rule. The FCC’s rule generally prohibits the common ownership of a radio or television broadcast station and a daily newspaper in the same market. We do not currently own any daily newspapers, nor do we have current plans to acquire one. National Ownership Rule. By statute, the national television viewing audience reach cap is 39%. Under this rule, where an individual or entity has an attributable interest in more than one television station in a market, the percentage of the national television viewing audience encompassed within that market is only counted once. Additionally, since historically, VHF stations (channels 2 through 13) shared a larger portion of the market than UHF stations (channels 14 through 51), only half of the households in the market area of any UHF station are included when calculating an entity’s national television viewing audience (commonly referred to as the UHF discount). On September 26, 2013, the FCC initiated a rulemaking seeking comment on whether (a) the FCC has the authority to modify the national ownership rule, including revision or elimination of the UHF discount; (b) the UHF discount should be eliminated; (c) if the UHF discount is eliminated, grandfathering should be accorded where owners of television groups would exceed the 39% national audience cap by virtue of the elimination of the discount; and (d) a discount for VHF station ownership should be adopted. We cannot predict the outcome of that rulemaking. While this rulemaking is pending, the FCC may not allow us to acquire additional television stations that would put us over the 39% cap without application of the UHF discount. All but twenty-eight of the stations we own and operate, or to which we provide programming services, are UHF. We reach over 37.4% of U. S. television households or 23.2% taking into account the FCC’s UHF discount. Local Television (Duopoly) Rule. A party may own television stations in adjoining markets, even if there is Grade B overlap between the two stations’ broadcast signals and generally may own two stations in the same market only (i) if there is no Grade B overlap between the stations; or (ii) if the market containing both the stations will contain at least eight independently owned full-power television stations post-merger (the eight voices test) and not more than one station is among the top-four rated stations in the market. Certain of our stations have entered into agreements with other stations in the same market, through which we provide programming and operating services pursuant to time brokerage or local marketing agreements (LMAs) or provide sales services and other non-programming operating services pursuant to outsourcing agreements (such as JSAs and SSAs). LMAs and JSAs are attributable where a licensee holds an attributable interest in a television station and (i) programs more than 15% of another television station or (ii) sells more than 15% of the advertising on another station in the same market. LMAs existing prior to November 5, 1996 are currently grandfathered until further FCC action. In its Order approving the Allbritton transaction, the FCC expressed concerns that it believed Sinclair’s LMA in Charleston was not subject to grandfathering protection. Sinclair disagreed with the FCC’s interpretation but cannot predict what steps, if any, the FCC will take in the future with respect to that LMA, which has been terminated with respect to the Charleston market, but continues in effect with respect to other stations. JSAs existing as of March 31, 2014 are grandfathered until October 1, 2025. We cannot predict whether we will be able to terminate or restructure such JSAs prior to October 1, 2025, on terms that are as advantageous to us as the current arrangements. If we are required to terminate or modify our LMAs or JSAs, our business could be adversely affected in several ways, including losses on investments and termination penalties. For more information on the risks, see Changes in rules on local marketing agreements within The FCC’s multiple ownership rules limit our ability to operate multiple television stations in some markets and may result in a reduction in our revenue or prevent us from reducing costs. Changes in these rules may threaten our existing strategic approach to certain television markets within Risk Factors and Changes in the Rules on Television Ownership within Note 11. Commitments and Contingencies for further discussion. In March, 2014, the FCC issued a public notice on the processing of broadcast television applications proposing sharing arrangements and contingent interests. The public notice indicated that the FCC will closely scrutinize any broadcast assignment or transfer application that proposes that two or more stations in the same market will enter into an agreement to share facilities, employees and/or services or to jointly acquire programming or sell advertising including through a JSA, LMA or similar agreement and enter into an option, right of first refusal, put /call arrangement or other similar contingent interest, or a loan guarantee. We cannot now predict what actions the FCC may require in connection with the processing of applications for FCC consent to future transactions. Antitrust Regulation. DOJ and the Federal Trade Commission have increased their scrutiny of the television industry and have reviewed matters related to the concentration of ownership within markets (including LMAs and outsourcing agreements) even when ownership or the LMA or other outsourcing agreement in question is permitted under the laws administered by the FCC or by FCC rules and regulations. The DOJ takes the position that an LMA or other outsourcing agreement entered into in anticipation of a station’s acquisition with the proposed buyer of the station constitutes a change in beneficial ownership of the station which, if subject to filing under the Hart-Scott-Rodino Antitrust Improvements Act, cannot be implemented until the waiting period required by that statute has ended or been terminated. The Satellite Home Viewer Act (SHVA), as extended by The Satellite Home Viewer Improvement Act of 1999 (SHVIA), the Satellite Home Viewer Extension and Reauthorization Act (SHVERA), the Satellite Television Extension and Localism Act of 2010 (STELA) and the Satellite Television Extension and Localism Act Reauthorization (STELAR) among other things, (i) allows satellite carriers to provide local television signals by satellite within a station market, and to carry all local signals in any market where they carry any local signals, (ii) requires all television stations to elect to exercise certain “must-carry” or “retransmission consent” rights in connection with their carriage by satellite carriers, and (iii) authorizes satellite delivery of distant network signals, significantly viewed signals and local low-power television station signals into local markets under defined circumstances. Television broadcasters are required to make triennial elections to exercise either certain “must-carry” or “retransmission consent” rights in connection with their carriage by cable systems in each broadcaster’s local market. By electing to exercise must-carry rights, a broadcaster demands carriage and receives a specific channel on cable systems within its DMA. Must carry rights are not absolute and are dependent on a number of factors which may or may not be present in a particular case. Alternatively, if a broadcaster chooses to exercise retransmission consent rights, it can prohibit cable systems from carrying its signal or grant the appropriate cable system the authority to retransmit the broadcast signal for a fee or other consideration. We have elected to exercise our retransmission consent rights with respect to all our stations. Effective June 18, 2014, the FCC changed its rules implementing the statutory duty to negotiate retransmission consent agreements in good faith. With this change, a television broadcast station is prohibited from negotiating retransmission consent jointly with another television station in the same market if the stations are not under common “de jure” control as such term is defined by the FCC. Under the rule changes, a station may not delegate authority to negotiate or approve a retransmission consent agreement to a station located in the same market or to a third party that negotiates together with another television station in the same market; neither may stations in the same market facilitate or agree to facilitate coordinated negotiation of retransmission consent terms for their stations in that market, including through the sharing of information. The Company cannot predict what effect, if any, the new rules may have on future negotiations for retransmission consent agreements. Further, in September 2015, the FCC released a Notice of Proposed Rulemaking in response to a Congressional directive in STELAR to examine the “totality of the circumstances test” for good-faith negotiations of retransmission consent. The proposed rulemaking seeks comment on new factors and evidence to consider in its evaluation of claims of bad faith negotiation, including service interruptions prior to a “marquee sports or entertainment event,” restrictions on online access to broadcast programming during negotiation impasses, broadcasters’ ability to offer bundles of broadcast signals with other broadcast stations or cable networks, and broadcasters’ ability to invoke the FCC’s exclusivity rules during service interruptions. We cannot predict the impact such rulemaking may have on our retransmission consent negotiations. which we own or program stations affiliated with a network, a station that is affiliated with the same network in a nearby market is carried on cable systems in our markets. Such significantly viewed signals are not subject to black out pursuant to FCC’s network non-duplication rules. The carriage of two network stations on the same cable system could result in a decline of viewership, adversely affecting the revenues of our owned or programmed stations. In March, 2014, the FCC issued a Report And Order And Further Notice Of Proposed Rulemaking, requesting comments on whether it has authority to, and should, eliminate or modify its network non-duplication and/or syndicated exclusivity rules. We cannot predict when or how the FCC will resolve that rulemaking. FCC rules provide that television broadcast licensees may use their digital television (DTV) channels for a wide variety of services such as HD television, multiple standard definition television programming, audio, data and other types of communications, subject to the requirement that each broadcaster provide at least one free video channel equal in quality to the current technical standard and further subject to the requirement that broadcasters pay a fee of 5% of gross revenues from any DTV ancillary or supplementary service for which there is a subscription fee or for which the licensee receives a fee from a third party. The Communications Act requires broadcasters to serve the “public interest.” The FCC has relaxed or eliminated many of the more formalized procedures it had developed in the past to promote the broadcast of certain types of programming responsive to the needs of a station’s community of license. FCC licensees continue to be required, however, to present programming that is responsive to the needs and interests of their communities and to maintain certain records demonstrating such responsiveness. Complaints from viewers concerning a station’s programming may be considered by the FCC when it evaluates renewal applications of a licensee, although such complaints may be filed at any time and generally may be considered by the FCC at any time. Stations also must pay regulatory and application fees and follow various rules promulgated under the Communications Act that regulate, among other things, political advertising, sponsorship identifications, obscene and indecent broadcasts and technical operations, including limits on radio frequency radiation. In addition, television licensees have obligations to create and follow employment outreach programs, provide a minimum amount of programming for children, comply with rules relating to the emergency alert system (EAS), maintain an online public inspection file and abide by regulations specifying requirements to provide closed captions for its programming. FCC licensees are, in general, responsible for the content of their broadcast programming, including that supplied by television networks. Accordingly, there is a risk of being fined as a result of our broadcast programming, including network programming. Congress and the FCC have under consideration and in the future may consider and adopt, new laws, regulations and policies regarding a wide variety of matters that could affect, directly or indirectly, the operation, ownership and profitability of our broadcast stations, result in the loss of audience share and advertising revenues for our broadcast stations and affect our ability to acquire additional broadcast stations or finance such acquisitions. Other matters that could affect our broadcast properties include technological innovations and developments generally affecting competition in the mass communications industry, such as direct television broadcast satellite service, Class A television service, the continued establishment of wireless cable systems and low power television stations, digital television technologies, the internet and mobility and portability of our broadcast signal to hand-held devices. Congress authorized the FCC to conduct so-called “incentive auctions” to auction and repurpose broadcast television spectrum for mobile broadband use. Pursuant to the “reverse” auction, a television broadcaster can submit bids to receive compensation for relinquishing all or a portion of its rights in the television spectrum of their full-service and Class A stations. A broadcaster has the option to bid to relinquish its channel entirely, relocate to a different band (UHF to VHF) or relinquish its channel and enter into a channel sharing agreement to channel share with another broadcaster. After completion of the reverse auction, the FCC will conduct a “forward auction” of the newly freed spectrum to be sold for wireless broadband use. The FCC must complete both auctions by 2022. Even though participation in the incentive auction is voluntary, a non-participating broadcaster may still be required to relocate its station to another channel or make technical changes to facilitate repacking the band. The legislation authorizing the incentive auction provides the FCC with a $1.75 billion fund to compensate broadcasters and cable systems for the reasonable costs of repacking. We do not know if such fund will be sufficient to fully compensate broadcasters for such repacking. Applications to participate in the reverse auction were due on January 12, 2016 and applications to participate in the forward auction were due on February 10, 2016. The reverse auction is currently scheduled to begin on March 29, 2016. In March 2014, the FCC issued a further Notice of Proposed Rulemaking and Report and Order which proposes, among other things, (i) eliminating the newspaper/radio cross ownership rule and the radio/television cross ownership rule, (ii) retaining the newspaper/television cross ownership rule but allowing for waivers on a case by case basis, (iii) retaining the local television rules, and (iv) prohibiting two television stations in the same market from swapping network affiliations if it would result in a single owner having two top-four network affiliations in a market where it could not otherwise own both affiliation-swapping stations. The proposed rulemaking also seeks comment on how to define a television shared services agreement and whether television stations should be required to disclose shared services agreements and how best to achieve disclosure. The preceding summary is not a complete discussion of all provisions of the Communications Act or other congressional acts or of the regulations and policies of the FCC, or in some cases, the DOJ. For further information, reference should be made to the Communications Act other congressional acts and regulations and public notices circulated from time to time by the FCC, or in some cases, the DOJ. There are additional regulations and policies of the FCC and other federal agencies that govern political broadcasts, advertising, equal employment opportunity and other matters affecting our business and operations. Prior to our ownership or operation of our facilities, substances or waste that are, or might be considered, hazardous under applicable environmental laws may have been generated, used, stored or disposed of at certain of those facilities. In addition, environmental conditions relating to the soil and groundwater at or under our facilities may be affected by the proximity of nearby properties that have generated, used, stored or disposed of hazardous substances. As a result, it is possible that we could become subject to environmental liabilities in the future in connection with these facilities under applicable environmental laws and regulations. Although we believe that we are in substantial compliance with such environmental requirements and have not in the past been required to incur significant costs in connection therewith, there can be no assurance that our costs to comply with such requirements will not increase in the future or that we will not become subject to new governmental regulations, including those pertaining to potential climate change legislation, that may impose additional restrictions or costs on us. We presently believe that none of our properties have any condition that is likely to have a material adverse effect on our consolidated balance sheets, consolidated statements of operations or consolidated statements of cash flows. Our television stations compete for audience share and advertising revenue with other television stations in their respective DMAs, as well as with other advertising media such as MVPDs, radio, newspapers, magazines, outdoor advertising, transit advertising, telecommunications providers, internet and other digital media, and direct mail. Some competitors are part of larger organizations with substantially greater financial, technical and other resources than we have. Other factors that are material to a television station’s competitive position include signal coverage, local program acceptance, network affiliation or program service, audience characteristics and assigned broadcast frequency. Competition in the television broadcasting industry occurs primarily in individual DMAs. Generally, a television broadcasting station in one DMA does not compete with stations in other DMAs. Our television stations are located in highly competitive DMAs. MVPDs can increase competition for a broadcast television station by bringing into its market additional cable network channels. These narrow cable network channels are typically low rated, and, as a result, advertisements are inexpensive to the local advertisers. In addition, certain of our DMAs are overlapped by over-the-air station from adjacent DMAs and MVPDs of stations from other DMAs, which tends to spread viewership and advertising expenditures over a larger number of television stations. Television stations compete for audience share primarily on the basis of program popularity, which has a direct effect on advertising rates. Our network affiliated stations are largely dependent upon the performance of network provided programs in order to attract viewers. Non-network time periods are programmed by the station primarily with syndicated programs purchased for cash, cash and barter or barter-only, as well as through self-produced news, public affairs programs, live local sporting events, paid-programming and other entertainment programming. Television advertising rates are based upon factors which include the size of the DMA in which the station operates, a program’s popularity among the viewers that an advertiser wishes to attract, the number of advertisers competing for the available time, the demographic makeup of the DMA served by the station, the availability of alternative advertising media in the DMA, the aggressiveness and knowledge of the sales forces in the DMA and development of projects, features and programs that tie advertiser messages to programming. We believe that our sales and programming strategies allow us to compete effectively for advertising revenues within our DMAs. The television broadcasting industry is continuously faced with technical changes and innovations, competing entertainment and communications media, changes in labor conditions and governmental restrictions or actions of federal regulatory bodies, including the FCC, any of which could possibly have a material effect on a television station’s operations and profits. Moreover, technology advances and regulatory changes affecting programming delivery through fiber optic lines, video compression, and new wireless uses could lower entry barriers for new video channels and encourage the further development of increasingly specialized “niche” programming. Telephone companies are permitted to provide video distribution services, on a common carrier basis, as “cable systems” or as “open video systems,” each pursuant to different regulatory schemes. DTV technology allows us to provide viewers multiple channels of digital television over each of our existing standard digital channels, to provide certain programming in HD television format and to deliver other channels of information in the forms of data and programming to the internet, PCs, smart phones, tablet computers and mobile devices. These additional capabilities may provide us with additional sources of revenue, as well as additional competition. We also compete for programming, which involves negotiating with national program distributors or syndicators that sell first-run and rerun packages of programming. Our stations compete for access to those programs against in-market broadcast station competitors for syndicated products and with national cable networks. Public broadcasting stations generally compete with commercial broadcasters for viewers, but not for advertising dollars. We believe we compete favorably against other television stations because of our management skill and experience, our ability historically to generate revenue share greater than our audience share, our network affiliations and program service arrangements and our local program acceptance. In addition, we believe that we benefit from the operation of multiple broadcast properties, affording us certain non-quantifiable economies of scale and competitive advantages in the purchase of programming. As of December 31, 2015, we had approximately 8,000 employees. Approximately 850 employees are represented by labor unions under certain collective bargaining agreements. We have not experienced any significant labor problems and consider our overall labor relations to be good. We regularly use our website as a source of company information and it can be accessed at www.sbgi.net. We make available, free of charge through our website, our annual report on Form 10-K, quarterly reports on Form 10-Q, current reports on Form 8-K and amendments to those reports filed or furnished pursuant to Section 13(a) or 15(d) of the Exchange Act as soon as reasonably practicable after such documents are electronically submitted to the SEC. In addition, a replay of each of our quarterly earnings conference calls is available on our website until the subsequent quarter’s earnings call. The information contained on, or otherwise accessible through, our website is not a part of this Annual Report on Form 10-K and is not incorporated herein by reference. You should carefully consider the risks described below before investing in our securities. Our business is also subject to the risks that affect many other companies such as general economic conditions, geopolitical events, competition, technological obsolescence and employee relations. The risks described below, along with risks not currently known to us or that we currently believe are immaterial, may impair our business operations and our liquidity in an adverse way. Our advertising revenue can vary substantially from period to period based on many factors beyond our control. This volatility affects our operating results and may reduce our ability to repay indebtedness or reduce the market value of our securities. other factors that may be beyond our control. There can be no assurance that our advertising revenue will not be volatile in the future or that such volatility will not have an adverse impact on our business, financial condition or results of operations. Our substantial indebtedness could adversely affect our financial condition and prevent us from fulfilling our debt obligations. because the interest rate under the Bank Credit Agreement is a floating rate, any increase will reduce the funds available to repay our obligations and for operations and future business opportunities and will make us more vulnerable to the consequences of our leveraged capital structure. As of December 31, 2015, approximately $1,693.2 million principal amount of our recourse debt relates to the Bank Credit Agreement. Any of these events could reduce our ability to generate cash available for investment, debt repayment or capital improvements or to respond to events that would enhance profitability. Commitments we have made to our lenders limit our ability to take actions that could increase the value of our securities and business or may require us to take actions that decrease the value of our securities and business. financial ratio and condition tests including, the ratio of first lien indebtedness to adjusted EBITDA and the ratio of Sinclair Television Group, Inc. (STG) total indebtedness to adjusted EBITDA. Future financing arrangements may contain additional restrictions and tests. All of these restrictive covenants may limit our ability to pursue our business strategies, prevent us from taking action that could increase the value of our securities or may require actions that decrease the value of our securities. In addition, we may fail to meet the tests and thereby default on one or more of our obligations (particularly if the economy weakens and thereby reduces our advertising revenues). If we default on our obligations, creditors could require immediate payment of the obligations or foreclose on collateral. If this happens, we could be forced to sell assets or take other actions that could significantly reduce the value of our securities and business and we may not have sufficient assets or funds to pay our debt obligations. A failure to comply with covenants under our debt instruments could result in a default under such debt instruments, acceleration of amounts due under our debt and loss of assets securing our loans. Certain of our debt agreements contain cross-default provisions with our other debt, which means that a default under certain of our debt instruments may cause a default under certain indentures or the Bank Credit Agreement. If we breach certain of our debt covenants, our lenders could require us to repay the debt immediately, and, if the debt is secured, could immediately take possession of the property securing such debt. In addition, if any other lender declared its loan due and payable as a result of a default, the holders of our outstanding notes, along with the lenders under the Bank Credit Agreement, might be able to require us to pay those debts immediately. As a result, any default under our debt covenants could have a material adverse effect on our financial condition and our ability to meet our obligations. Any insolvency or bankruptcy proceeding relating to material third-party licensees as defined by our Bank Credit Agreement, would cause a default and potential acceleration under the Bank Credit Agreement. Our Bank Credit Agreement contains certain cross-default provisions with certain material third-party licensees, defined as any party that owns the license assets of one or more television stations for which we provided services to pursuant to LMAs and/or other outsourcing agreements and those stations provide 20% or more of our aggregate broadcast cash flows. A default caused by an involuntary or voluntary petition filed for liquidation, reorganization or other relief of insolvency by a material third-party licensee, or a failure of a material third-party licensee to preserve and maintain its legal existence or any of its material rights, privileges or franchises including its broadcast licenses, would cause an event of default and potential acceleration under our Bank Credit Agreement. As of December 31, 2015, there were no material third party licensees as defined in our Bank Credit Agreement. Despite current debt levels, we may be able to incur significantly more debt in the future, which could increase the foregoing risks related to our indebtedness. At December 31, 2015, we had $482.9 million available (subject to certain borrowing conditions) for additional borrowings under the revolving credit facility (the Revolving Credit Facility) of the Bank Credit Agreement. Under the terms of the debt instruments to which we are subject, and provided we meet certain financial and other covenants, we may be able to incur substantial additional indebtedness in the future, including additional senior debt and secured debt. If we incur additional indebtedness, the risks described in the risk factors in this report relating to having substantial debt could intensify. Our strategic acquisitions could pose various risks and increase our leverage. We have pursued and intend to selectively continue to pursue strategic acquisitions, subject to market conditions, our liquidity and the availability of attractive acquisition candidates, with the goal of improving our business. We may not be able to identify other attractive acquisition targets or we may not be able to fund additional acquisitions in the future. Acquisitions involve inherent risks, such as increasing leverage and debt service requirements and combining company cultures and facilities, which could have a material adverse effect on our results of operations and could strain our human resources. We may not be able to successfully implement effective cost controls or increase revenues as a result of an acquisition. In addition, future acquisitions may result in our assumption of unexpected liabilities and may result in the diversion of management’s attention from the operation of our core business. Certain acquisitions, such as television stations, are subject to the approval of the FCC and potentially, other regulatory authorities. The need for FCC and other regulatory approvals could restrict our ability to consummate future transactions and potentially require us to divest certain television stations if the FCC believes that a proposed acquisition would result in excessive concentration in a market, even if the proposed combinations may otherwise comply with FCC ownership limitations. Our investments in other operating subsidiaries involve risks, including the diversion of resources, that may adversely affect our business or results of operations. We have made investments in certain non-media related businesses. See Item 1. Business for further description of such investments and/or subsidiaries. Managing the operations of these businesses and the costs incurred by these businesses involve risks, including the diversion of our management’s attention from managing the operations of our broadcast businesses and diverting other resources that could be used in our broadcast businesses. Such diversion of resources may adversely affect our business and results of operations. In addition, our investments in real estate ventures carry inherent risks related to owning interests in real property, including, among others, the relative illiquidity of real estate, potential adverse changes in real estate market conditions, and changes in tenant preferences. There can be no assurance that our investments in these businesses will yield a positive rate of return or otherwise be recoverable. Financial and economic conditions may have an adverse impact on our industry, business, and results of operations or financial condition. our ability to make certain capital expenditures may be significantly impaired. We purchase television programming in advance based on expectations about future revenues. Actual revenues may be lower than our expectations. If this happens, we could experience losses that may make our securities less valuable. One of our most significant costs is television programming. Our ability to generate revenue to cover this cost may affect the value of our securities. If a particular program is not popular in relation to its costs, we may not be able to sell enough advertising time to cover the costs of the program. Since we generally purchase programming content from others rather than producing such content ourselves, we have limited control over the costs of the programming. Often we must purchase programming several years in advance and may have to commit to purchase more than one year’s worth of programming. We may replace programs that are doing poorly before we have recaptured any significant portion of the costs we incurred or before we have fully amortized the costs. Any of these factors could reduce our revenues or otherwise cause our costs to escalate relative to revenues. These factors are exacerbated during a weak advertising market. Additionally, our business is subject to the popularity of the programs provided by the networks with which we have network affiliation agreements or which provide us programming. We internally originate television programming in advance based on expectations about future revenues. Actual revenues could fluctuate and may be lower than our expectations If this happens, we could experience losses that may make our securities less valuable. The production of internally originated programming requires a large up-front investment and the revenues derived from the airing of internally originated programming primarily depends upon its acceptance by the public, which is difficult to predict. The commercial success of original content also depends upon the quality and acceptance of other competing content released into the marketplace at or near the same time, the availability of a growing number of alternative forms of entertainment, general economic conditions and their effects on consumer spending and other tangible and intangible factors, all of which can change and cannot be predicted with certainty. Any of these factors could reduce our revenues or otherwise cause our costs to escalate relative to revenues. These factors are exacerbated during a weak advertising market. We may lose a large amount of programming if a network terminates its affiliation or program service arrangement with us, we are not able to negotiate arrangements at terms comparable to or more favorable than our current agreements, or if networks make programming available through services other than our local affiliates, which could increase our costs and/or reduce our revenue. The networks produce and distribute programming in exchange for each station’s commitment to air the programming at specified times and for commercial announcement time during programming. The amount and quality of programming provided by each network varies. See Television Markets and Stations within Item 1. Business for a detailed listing of our stations and channels. As network affiliation agreements come up for renewal, we (or licensees of the stations we provide programming and/or sales services to), may not be able to negotiate terms comparable to or more favorable than our current agreements. The non-renewal or termination of any of our network affiliation agreements would prevent us from being able to carry programming of the relevant network. This loss of programming would require us to obtain replacement programming, which may involve higher costs and which may not be as attractive to our target audiences, resulting in reduced revenues. Upon the termination of any of our network affiliation agreements, we would be required to establish a new network affiliation agreement for the affected station with another network or operate as an independent station. At such time, the remaining value of the network affiliation asset could become impaired and we would be required to record impairment charges to write down the value of the asset to its estimated fair value. We cannot predict the outcome of any future negotiations relating to our affiliation agreements or what impact, if any, they may have on our financial condition and results of operations. In addition, the impact of an increase in reverse network compensation payments, under which we compensate the network for programming pursuant to our affiliation agreements, may have a negative effect on our financial condition or results of operations. We may not be able to renegotiate retransmission consent agreements at terms comparable to or more favorable than our current agreements and networks with which we are affiliated are currently, or in the future are expected to, require us to share revenue from retransmission consent agreements with them. are currently, or in the future are expected to, require us to share revenue from retransmission consent agreements with them as part of renewing expiring affiliation agreements or pursuant to certain rights contained in existing affiliation agreements. There can be no assurances that the amounts shared will not increase at expiration of the current contracts. In December, 2014, a new statutory provision was adopted which required the FCC to adopt rules prohibiting joint retransmission consent negotiation by stations that are located in the same market but are not commonly owned. The FCC issued an Order on February 18, 2015, adopting rules which implement the new statutory provision. During a recent retransmission consent negotiation, DISH Network LLC (DISH) filed a complaint with the FCC accusing us of violating this rule. Although we reached agreement with DISH and they withdrew their complaint, the FCC is still looking into the allegations made by DISH and we are unable to predict the outcome of the FCC’s actions. The effects of the economic environment could require us to record an asset impairment of goodwill and broadcast licenses. We are required to analyze goodwill and certain other intangible assets for impairment. The accounting guidance establishes a method of testing goodwill and broadcast licenses for impairment on an annual basis, or on an interim basis if an event occurs that would reduce the fair value of a reporting unit or an indefinite-lived asset below its carrying value. For additional information regarding impairments to our goodwill and broadcast licenses, see Valuation of Goodwill and Intangible Assets and Equity and Cost Method Investments under Critical Accounting Policies and Estimates within Item 7. Management’s Discussion and Analysis of Financial Condition and Results of Operations and Note 6. Goodwill, Broadcast Licenses and Other Intangible Assets within the Consolidated Financial Statements. Key officers and directors have financial interests that are different and sometimes opposite from ours and we may engage in transactions with these officers and directors that may benefit them to the detriment of other security holders. Some of our officers, directors and majority shareholders own stock or partnership interests in businesses that do business with us or otherwise do business that conflicts with our interests. They may transact some business with us upon approval by the independent members of our board of directors even if there is a conflict of interest or they may engage in business competitive to our business and those transactions may benefit the officers, directors or majority shareholders to the detriment of our security holders. Each of David D. Smith, Frederick G. Smith, and J. Duncan Smith is an officer and director of Sinclair and Robert E. Smith is a director of Sinclair. Together, the Smiths hold shares of our common stock that control the outcome of most matters submitted to a vote of shareholders. David D. Smith, Frederick G. Smith, J. Duncan Smith, Robert E. Smith and David B. Amy, our Executive Vice President and Chief Operating Officer, together own interests (less than 5% in aggregate) in Allegiance Capital Limited Partnership, a limited partnership in which we also hold an interest. Frederick G. Smith owns an interest (less than 1%) in Patriot Capital II, L.P., a limited partnership in which we also hold an interest. David Smith owns an interest (less than 3%) in Towson Row LLC, a real estate venture, in which we also hold an interest. For additional information regarding our related person transactions, see Note 12. Related Person Transactions within the Consolidated Financial Statements. We can give no assurance that these transactions or any transactions that we may enter into in the future with our officers, directors or majority shareholders, have been, or will be, negotiated on terms as favorable to us as we would obtain from unrelated parties. Maryland law and our financing agreements limit the extent to which our officers, directors and majority shareholders may transact business with us and pursue business opportunities that we might pursue. These limitations do not, however, prohibit all such transactions. We depend on key personnel and we may not be able to operate and grow our business effectively if we lose the services of our senior executive officers or are unable to attract and retain qualified personnel in the future. We depend on the efforts of our management and other key employees. The success of our business depends heavily on our ability to develop and retain management and to attract and retain qualified personnel in the future. Competition for senior management personnel is intense, and we may not be able to retain our key personnel. If we are unable to do so, our business, financial condition or results of operations may be adversely affected. The Smiths exercise control over most matters submitted to a shareholder vote and may have interests that differ from other security holders. They may, therefore, take actions that are not in the interests of other security holders. of directors’ seats and, therefore, have the power to exert significant influence over our corporate management and policies. The Smiths have entered into a stockholders’ agreement pursuant to which they have agreed to vote for each other as candidates for election to our board of directors until December 31, 2025. Although in the past the Smiths have recused themselves from related person transactions, circumstances may occur in which the interests of the Smiths, as the controlling security holders, could be in conflict with the interests of other security holders and the Smiths would have the ability to cause us to take actions in their interest. In addition, the Smiths could pursue acquisitions, divestitures or other transactions that, in their judgment, could enhance their equity investment, even though such transactions might involve risks to our other security holders. Further, the concentration of ownership the Smiths have may have the effect of discouraging, delaying or preventing a future change of control, which could deprive our stockholders of an opportunity to receive a premium for their shares as part of a sale of our company and might reduce the price of our shares. Significant divestitures by the Smiths could cause them to own or control less than 51% of the voting power of our shares, which would in turn give Cunningham the right to terminate the LMAs and other outsourcing agreements with Cunningham due to a “change in control.” Any such terminations would have an adverse effect on our results of operations. The FCC’s multiple ownership rules limit our ability to operate multiple television stations in some markets and may result in a reduction in our revenue or prevent us from reducing costs. Changes in these rules may threaten our existing strategic approach to certain television markets. See the risk factor below regarding the FCC's multiple ownership rules. We may be subject to fines and other penalties related to violations of FCC indecency rules and other FCC rules and policies, the enforcement of which has increased in recent years, and complaints related to such violations may delay our renewal applications with the FCC. We provide a significant amount of live news reporting that is provided by the broadcast networks or is controlled by our on-air news talent. Although both broadcast network and our on-air talent have generally been professional and careful in what they say, there is always the possibility that information may be reported that is inaccurate or even in violation of certain indecency rules promulgated by the FCC. In addition, entertainment and sports programming provided by broadcast syndicators and networks may contain content that is in violation of the indecency rules promulgated by the FCC. Because the interpretation by the courts and the FCC of the indecency rules is not always clear, it is sometimes difficult for us to determine in advance what may be indecent programming. We have insurance to cover some of the liabilities that may occur, but the FCC has enhanced its enforcement efforts relating to the regulation of indecency. Violation of the indecency rules could potentially subject us to penalties, license revocation, or renewal or qualification proceedings. We are currently subject to pending FCC inquiries and proceedings relating to alleged violations of indecency, sponsorship identification, children’s programming and captioning rules. There can be no assurance that an incident that may lead to significant fines or other penalties by the FCC can be avoided. In addition, action on many license renewal applications, including those we have filed, has been delayed because of, among other reasons, the pendency of complaints that programming aired by the various networks contained indecent material and complaints regarding alleged violations of sponsorship identification, children’s programming and captioning rules. We cannot predict when the FCC will address these complaints and act on the renewal applications. We continue to have operating authority until final action is taken on our renewal applications. Federal regulation of the broadcasting industry limits our operating flexibility, which may affect our ability to generate revenue or reduce our costs. The FCC regulates our business, just as it does all other companies in the broadcasting industry. We must ask the FCC’s approval whenever we need a new license, seek to renew, assign or modify a license, purchase a new station, sell an existing station or transfer the control of one of our subsidiaries that hold a license. Our FCC licenses and those of the licensees for which we provide services to pursuant to LMAs and other outsourcing agreements are critical to our operations; we cannot operate without them. We cannot be certain that the FCC will renew these licenses in the future or approve new acquisitions in a timely manner, if at all. If licenses are not renewed or acquisitions are not approved, we may lose revenue that we otherwise could have earned. The FCC’s multiple ownership rules limit our ability to operate multiple television stations in some markets and may result in a reduction in our revenue or prevent us from reducing costs. Changes in these rules may threaten our existing strategic approach to certain television markets. As discussed in National Ownership Rule within Federal Regulation of Television Broadcasting within Item 1. Business, the FCC is currently considering elimination of the discount given to owners of UHF stations in determining compliance with the cap. Because we would be near the 39% cap without application of the UHF discount, the proposed change, if adopted, could limit our ability to acquire television stations in additional markets. While this rulemaking is pending, the FCC may not allow us to acquire additional television stations that would put us over the 39% cap without application of the UHF discount. Under federal law, the FCC is required to review its ownership rules every four years (a ‘‘Quadrennial Review’’) to determine whether they are necessary in the public interest as the result of competition and to repeal or modify any regulation the FCC determines to be no longer in the public interest. On March 30, 2014, the FCC issued a Further Notice of Proposed Rulemaking and Report and Order (the ‘‘Further Notice’’) and announced that it would incorporate the record of the 2010 Quadrennial Review into a new 2014 Quadrennial Review, and requested additional comments on, among other things, whether to eliminate restrictions on newspaper/radio combinations and whether to eliminate the radio/television cross-ownership rule. The Further Notice indicated that the FCC intended to retain the current local television and radio ownership rule with a minor technical update and to retain the prohibition on the cross ownership of newspapers and television without modification. The FCC adopted a new rule in the Further Notice which causes a station to be attributable to the owner of another station in the market which sells more than 15 percent of the advertising on the first station pursuant to a JSA/SSA or other arrangement. Parties to existing agreements must come into compliance with these new rules by October 1, 2025. We are currently evaluating whether to seek one or more waivers of the new rules, or to modify or terminate our current JSA/SSAs. Certain of our stations have entered into what have commonly been referred to as local marketing agreements or LMAs. One typical type of LMA is a programming agreement between two separately owned television stations serving the same market, whereby the licensee of one station programs substantial portions of the broadcast day and sells advertising time during such programming segments on the other licensee’s station subject to the ultimate editorial and other controls being exercised by the latter licensee. We believe these arrangements allow us to reduce our operating expenses and enhance profitability. In addition to our LMAs, we have entered into outsourcing agreements (such as JSAs) whereby 28 stations provide or are provided various non-programming related services such as sales, operational and managerial services to or by other stations within the same markets. Pursuant to these agreements, 27 of our stations currently provide services to one or more stations in their respective market and another party provides services to 1 of our stations. We believe this structure allows stations to achieve operational efficiencies and economies of scale, which should otherwise improve broadcast cash flow and competitive positions. For additional information, refer to Television Markets and Stations within Item 1. Business. As discussed above, the FCC recently adopted a new rule which causes a station to be attributable to the owner of another station in the market which sells more than 15 percent of the advertising on the first station pursuant to a JSA/SSA or other arrangement. Parties to existing agreements must come into compliance with these new rules by October 1, 2025. See Changes in the Rules on Television Ownership within Note 11. Commitments and Contingencies with the Consolidated Financial Statements for further discussion. Loss of revenues. If the FCC requires us to modify or terminate existing arrangements, we would lose some or all of the revenues generated from those arrangements. We would lose revenue because we will have fewer demographic options, a smaller audience distribution and lower revenue share to offer to advertisers. During the year ended December 31, 2015, we generated $109.7 million of net revenue from our 12 LMAs. During the year ended December 31, 2015, we earned $46.8 million of revenue from other outsourcing agreements. Increased costs. If the FCC requires us to modify or terminate existing arrangements, our cost structure would increase as we would potentially lose significant operating synergies and we may also need to add new employees. With termination of LMAs, we likely would incur increased programming costs because we will be competing with the separately owned station for syndicated programming. Losses on investments. As part of certain of our arrangements, we own the non-license assets used by the stations with which we have arrangements. If certain of these arrangements are no longer permitted, we would be forced to sell these assets, restructure our agreements or find another use for them. If this happens, the market for such assets may not be as good as when we purchased them and, therefore, we cannot be certain of a favorable return on our original investments. Termination penalties. If the FCC requires us to modify or terminate existing arrangements before the terms of the arrangements expire, or under certain circumstances, we elect not to extend the terms of the arrangements, we may be forced to pay termination penalties under the terms of certain of our arrangements. Any such termination penalties could be material. Alternative arrangements. If the FCC requires us to terminate the existing arrangements, we may enter into one or more alternative arrangements. Any such arrangements may be on terms that are less beneficial to us than the existing arrangements. The FCC requires the owner / licensee of a station to maintain independent control over the programming and operations of the station. As a result, the owners / licensees of those stations with which we have LMAs can exert their control in ways that may be counter to our interests, including the right to preempt or terminate programming in certain instances. The preemption and termination rights cause some uncertainty as to whether we will be able to air all of the programming that we have purchased under our LMAs and therefore, uncertainty about the advertising revenue that we will receive from such programming. In addition, if the FCC determines that the owner / licensee is not exercising sufficient control, it may penalize the owner licensee by a fine, revocation of the license for the station or a denial of the renewal of that license. Any one of these scenarios, especially the revocation of or denial of renewal of a license, might result in a reduction of our cash flow or margins and an increase in our operating costs. In addition, penalties might also affect our qualifications to hold FCC licenses, putting our own licenses at risk. The pendency and indeterminacy of the outcome of these ownership rules, which may limit our ability to provide services to additional or existing stations pursuant to licenses, LMAs, outsourcing agreements or otherwise, expose us to a certain amount of volatility, particularly if the outcomes are adverse to us. Further, resolution of these ownership rules has been and will likely continue to be a cost burden and a distraction to our management and the continued absence of a resolution may have a negative effect on our business. The FCC’s National Broadband Plan may result in a loss of spectrum for our stations potentially adversely impacting our ability to compete. As discussed in Pending Matters under Federal Regulation of Television Broadcasting within Item. 1 Business, Congress has authorized the FCC to conduct so-called “incentive auctions” to auction and repurpose broadcast television spectrum for mobile broadband use. Even though participation in the incentive auction is voluntary, a non-participating broadcaster may still be required to relocate its station to another channel or make technical changes to facilitate repacking the band. We further cannot predict the outcome of the incentive auction or its effect upon our ability to compete. Additionally, we cannot predict whether the FCC or Congress might adopt even more stringent requirements or incentives to abandon current spectrum if the incentive auction does not have the desired result of freeing what the agency deems to be sufficient spectrum for wireless broadband use. Competition from other broadcasters or other content providers and changes in technology may cause a reduction in our advertising revenues and/or an increase in our operating costs. Cable providers, direct broadcast satellite companies and telecommunication companies are developing new technology that allows them to transmit more channels on their existing equipment to highly targeted audiences, reducing the cost of creating channels and potentially leading to the division of the television industry into ever more specialized niche markets. Competitors who target programming to such sharply defined markets may gain an advantage over us for television advertising revenues. The decreased cost of creating channels may also encourage new competitors to enter our markets and compete with us for advertising revenue. In addition, technologies that allow viewers to digitally record, store and play back television programming may decrease viewership of commercials as recorded by media measurement services such as Nielsen Media Research and, as a result, lower our advertising revenues. The current ratings provided by Nielsen for use by broadcast stations are limited to live viewing Digital Video Recording playback and give broadcasters no credit whatsoever for viewing that occurs on a delayed basis after the original air date. However, the effects of new ratings system technologies, including ‘‘people meters’’ and ‘‘set-top boxes,’’ and the ability of such technologies to be a reliable standard that can be used by advertisers is currently unknown. The Media Rating Council, an independent organization that monitors rating services, in the 154 markets it measures ratings exclusively by its diary methodology. As of December 31, 2015, approximately 52 of out 79 markets are diary only markets. Since digital television technology allows broadcasting of multiple channels within the additional allocated spectrum, this technology could expose us to additional competition from programming alternatives. In addition, technological advancements and the resulting increase in programming alternatives, such as cable television, direct broadcast satellite systems, pay-per-view, home video and entertainment systems, video-on-demand, mobile video and the Internet have also created new types of competition to television broadcast stations and will increase competition for household audiences and advertisers. We cannot provide any assurances that we will remain competitive with these developing technologies. other emerging technologies including mobile television, over-the-top technologies, and MVPD "skinny" packages. The Telecommunications Act of 1996 and subsequent actions by the FCC and the courts have removed some limits on station ownership, allowing telephone, cable and some other companies to provide video services in competition with us. In addition, the FCC has reallocated and auctioned off a portion of the spectrum for new services including fixed and mobile wireless services and digital broadcast services. As a result of these changes, new companies are able to enter our markets and compete with us. We have invested and will continue to invest in new technology initiatives which may not result in usable technology. We have heavily invested in the development of the Next Gen platforms as discussed in Development of Next Generation Broadcast Platforms (Next Gen) within Operating Strategy within Item 1. Business. We do not know whether the outcome of our research and development will result in technology that will be usable on our distribution platform or available to license to third parties. Additionally, even if our efforts result in usable technology, we do not know whether it will be included within the ATSC 3.0 framework. Any failure to develop this technology could result in the loss of our investment. Our cost incurred related to the development of the Next Gen platform is recorded within research and development within our consolidated statement of operations. We could be adversely affected by labor disputes and legislation and other union activity. The cost of producing and distributing entertainment programming has increased substantially in recent years due to, among other things, the increasing demands of creative talent and industry-wide collective bargaining agreements. Although we generally purchase programming content from others rather than produce such content ourselves, our program suppliers engage the services of writers, directors, actors and on-air and other talent, trade employees and others, some of whom are subject to these collective bargaining agreements. Also, as of February 19, 2016, approximately 850 of our employees, are represented by labor unions under collective bargaining agreements. If we or our program suppliers are unable to renew expiring collective bargaining agreements, it is possible that the affected unions could take action in the form of strikes or work stoppages. Failure to renew these agreements, higher costs in connection with these agreements or a significant labor dispute could adversely affect our business by causing, among other things, delays in production that lead to declining viewers, a significant disruption of operations and reductions in the profit margins of our programming and the amounts we can charge advertisers for time. Our stations also broadcast certain professional sporting events, including NBA basketball games, MLB baseball games, NFL football games, and other sporting events, and our viewership may be adversely affected by player strikes or lockouts, which could adversely affect our advertising revenues and results of operations. Further, any changes in the existing labor laws, including the possible enactment of the Employee Free Choice Act, may further the realization of the foregoing risks. Unrelated third parties may bring claims against us based on the nature and content of information posted on websites maintained by us. We host internet services that enable individuals to exchange information, generate content, comment on our content, and engage in various online activities. The law relating to the liability of providers of these online services for activities of their users is currently unsettled both within the United States and internationally. Claims may be brought against us for defamation, negligence, copyright or trademark infringement, unlawful activity, tort, including personal injury, fraud, or other theories based on the nature and content of information that may be posted online or generated by our users. Our defense of such actions could be costly and involve significant time and attention of our management and other resources. Costs of complying with changes in governmental laws and regulations may adversely affect our results of operations. We cannot predict what other governmental laws or regulations will be enacted in the future, how future laws or regulations will be administered or interpreted or how future laws or regulations will affect us. Compliance with new laws or regulations, including proposed legislation to address climate change, or stricter interpretation of existing laws, may require us to incur significant expenditures or impose significant restrictions on us and could cause a material adverse effect on our results of operations. Changes in accounting standards can affect reported earnings and results of operations. Generally accepted accounting principles and accompanying pronouncements and implementation guidelines for many aspects of our business, including those related to revenues, leases, consolidation, programming, intangible assets, pensions, income taxes, share-based compensation and broadcast rights, are complex and involve significant judgments. Changes in rules or their interpretation could significantly change our reported earnings and results of operations. Terrorism or armed conflict domestically or abroad may negatively impact our advertising revenues and results of operations. Future conflicts, terrorist attacks or other acts of violence may have a similar effect. If the United States becomes engaged in global conflicts in the future, there may be an adverse effect on our results of operations. Also, any terrorist attacks or other acts of violence may have a similar negative effect on our business or results of operations. Cyber incidents can result from deliberate attacks or unintentional events. These incidents can include, but are not limited to, gaining unauthorized access to digital systems for purposes of misappropriating assets or sensitive information, corruption data, or causing operational disruption. The result of these incidents could include, but are not limited to, disrupted operations, misstated financial data, liability for stolen assets or information, increased cybersecurity protection costs, litigation and reputational damage adversely affecting customer or investor confidence. We are a party to lawsuits and claims from time to time in the ordinary course of business. Actions currently pending are in various stages and no material judgments or decisions have been rendered by hearing boards or courts in connection with such actions. After reviewing developments to date with legal counsel, our management is of the opinion that none of our pending and threatened matters are material. Our Class A Common Stock is listed for trading on the NASDAQ stock market under the symbol SBGI. Our Class B Common Stock is not traded on a public trading market or quotation system. The following tables set forth for the periods indicated the high and low closing sales prices on the NASDAQ stock market for our Class A Common Stock. As of February 19, 2016, there were approximately 50 shareholders of record of our Class A common stock. This number does not include beneficial owners holding shares through nominee names. During 2014, our Board of Directors declared a quarterly dividend of $0.15 per share in the months of February and April, which were paid in March and June. In August and November our Board of Directors declared a quarterly dividend of $0.165 per share, which were paid in September and December. Total dividend payments for the year ended December 31, 2014 were $0.63 per share. During 2015, our Board of Directors declared a quarterly dividend of $0.165 per share in the months of February, April, August and November, which were paid in March, June, September and December, respectively. Total dividend payments for the year ended December 31, 2015 were $0.66 per share. In February 2016, our Board of Directors declared a quarterly dividend of $0.165 per share. Future dividends on our common shares, if any, will be at the discretion of our Board of Directors and will depend on several factors including our results of operations, cash requirements and surplus, financial condition, covenant restrictions and other factors that the Board of Directors may deem relevant. The Class A Common Stock and Class B Common Stock holders have the same rights related to dividends. Under our Bank Credit Agreement, there are certain terms that may restrict our ability to make dividend payments. See Note 9. Common Stock within the Consolidated Financial Statements for further discussion. 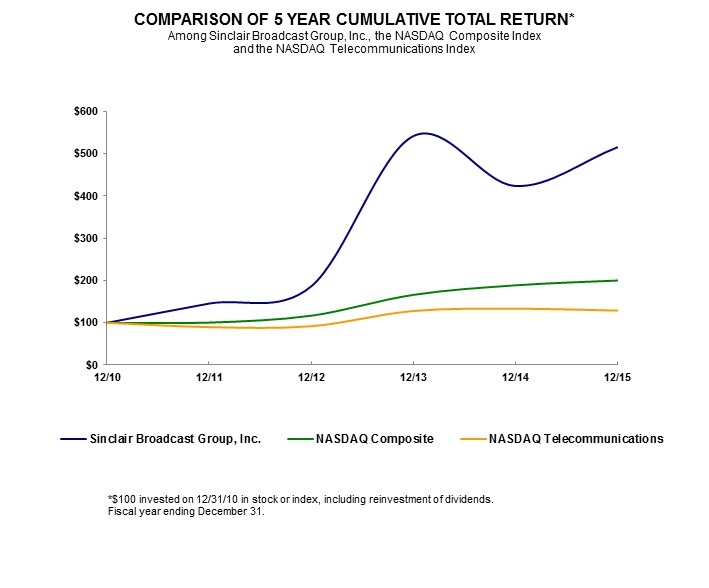 The following line graph compares the yearly percentage change in the cumulative total shareholder return on our Class A Common Stock with the cumulative total return of the NASDAQ Composite Index and the cumulative total return of the NASDAQ Telecommunications Index (an index containing performance data of radio and television broadcast companies and communication equipment and accessories manufacturers) from December 31, 2010 through December 31, 2015. The performance graph assumes that an investment of $100 was made in the Class A Common Stock and in each Index on December 31, 2010 and that all dividends were reinvested. Total shareholder return is measured by dividing total dividends (assuming dividend reinvestment) plus share price change for a period by the share price at the beginning of the measurement period. The selected consolidated financial data for the years ended December 31, 2015, 2014, 2013, 2012 and 2011 have been derived from our audited consolidated financial statements. The information below should be read in conjunction with Item 7. Management’s Discussion and Analysis of Financial Condition and Results of Operations and the Consolidated Financial Statements included elsewhere in this annual report on Form 10-K.
Media revenues is defined as broadcast revenues, net of agency commissions, retransmission fees, and other media related revenues. Depreciation and amortization includes depreciation and amortization of property and equipment and amortization of definite-lived intangible assets and other assets. Total debt is defined as notes payable, capital leases and commercial bank financing, including the current and long-term portions. The asset and debt balances for all years reflect the reclassification of debt issuance costs as discussed in Recent Accounting Pronouncements within Note 1. Nature of Operations and Summary of Significant Accounting Policies within the Consolidated Financial Statements. Liquidity and Capital Resources — a discussion of our primary sources of liquidity, an analysis of our cash flows from or used in operating activities, investing activities and financing activities, a discussion of our dividend policy and a summary of our contractual cash obligations and off-balance sheet arrangements. We have one reportable operating segment: broadcast.” Our broadcast segment is comprised of all of our television stations. We also earn revenues from our original networks, original content, digital and internet services, technical services, and non-media investments. These businesses are included within "Other". Corporate and unallocated expenses primarily include our costs to operate as a public company and to operate our corporate headquarters location. Other and Corporate are not reportable segments. STG, included in the broadcast segment and a wholly owned subsidiary of Sinclair Broadcast Group, Inc. (SBG), is the primary obligor under our Bank Credit Agreement, the 6.125% Notes, the 5.375% Notes, 6.375% Notes, and 5.625% Notes. SBG is a guarantor under all of these debt instruments. Our Class A Common Stock and Class B Common Stock remain obligations or securities of SBG and not obligations or securities of STG. SBG was the obligor of the 9.25% Notes and the 8.375% Notes until they were fully redeemed in 2013 and 2014, respectively. In February 2015, our Board of Directors declared a quarterly dividend of $0.165 per share, payable March 13, 2015 to the holders of record at the close of business on February 27, 2015. During the second quarter of 2015, we signed a multi-year retransmission consent agreement with COX Communications covering over 3.3 million subscribers and a 3-year retransmission consent agreement renewal with Suddenlink covering over 0.8 million subscribers. During the second quarter of 2015, American Sports Network (ASN) reached a multi-year agreement with the Atlantic 10 Conference (A-10) to annually televise at least 52 A-10 events across seven sports, an agreement with AMA Pro Racing to offer syndicated network television coverage of AMA Track Events, and an agreement with Minor League Baseball to televise a weekly game throughout the summer. In April 2015, we raised $350.0 million of incremental term B loans and amended certain terms under our existing bank credit facility. The loans mature July 2021 and were issued at a discount of 99.875% of par value. In May 2015, our Board of Directors declared a quarterly dividend of $0.165 per share, payable on June 12, 2015 to the holders of record at the close of business on June 1, 2015. In May 2015, Ring of Honor signed a national broadcast deal with Destination America, part of Discovery Communications, to televise events over twenty-six weeks. In June 2015, we announced a Memorandum of Understanding with Pearl TV and Samsung Electronics America to work collaboratively to support the development and implementation of the new Advanced Television Systems Committee (ATSC) 3.0 standard. In June 2015, we announced the formation of a joint venture with The Tornante Company that will acquire, create, develop, produce, and distribute first-run syndicated television programming. In June 2015, we invested in ExtendTV (rebranded as Zypmedia), the leading programmatic media-buying platform for local digital advertising. In July 2015, American Sports Network (ASN) announced an agreement with Millennium Dancesport Championships to televise “The Dancesport League” on ASN. In July 2015, we renewed affiliation agreements with the CBS Network covering 16 markets. The new agreements are effective in 2015 and 2016 as current affiliation agreements expire and run for five years to 2020 and 2021. In July 2015, we renewed affiliation agreements with the CW Network covering 23 owned markets. At the same time, the CW renewed affiliation agreements with another 9 markets for which Sinclair provides sales and other services. These agreements are effective August 2016 and expire in 2021. In July 2015, we announced the October 2015 launch of our Sunday morning national news show “Full Measure with Sharyl Attkisson." In August 2015, our Board of Directors declared a quarterly dividend of $0.165 per share, payable on September 15, 2015 to the holders of record at the close of business on September 1, 2015. In September 2015, we were granted authority by the Federal Communications Commission (FCC) to operate an experimental facility in Washington D.C. and Baltimore markets to implement a Single Frequency Network (SFN) using the base elements of the new ATSC 3.0 transmission standard. In September 2015, ASN entered into a sublicense agreement with ESPN to televise college football and basketball games for the Mid-American Conference (MAC) and college basketball games for the American Athletic Conference (The American), both beginning in the 2015 academic year. In September 2015, ASN entered into agreements with several top collegiate hockey conferences to broadcast as many as 30 total games per year. In September 2015, we announced the creation of a news segment called, "Connect to Congress", a multimedia initiative that enables Members of Congress in our news markets to communicate with their constituents on a regular basis. In September 2015, we closed on the acquisition of certain non-license assets of WDSI (FOX) and WFLI (CW) in Chattanooga, Tennessee, from New Age Media. In October 2015, we premiered, together with Metro-Goldwyn-Mayer (MGM), COMET, the first-ever 24 hour/7 day per week science fiction multi-channel network. In October 2015, the Company entered into a definitive agreement to acquire KFXL (FOX) and KHGI, KHGI-LD, KWNB and KWNB-LD (ABC), in Lincoln, Nebraska for $31.25 million. The transaction, subject to bankruptcy court and FCC approval and subject to standard closing conditions, is expected to close in early 2016. We expect to fund the acquisition with cash on hand in the first quarter of 2016. In December 2015, we announced that we will re-launched "Circa," an independent digital news site targeted at the younger demographic, in April 2016. In January 2016, we closed on the previously announced purchase of the assets of KUQI (FOX), KTOV-LP (MNT) and KXPX-LP (Retro TV) in Corpus Christi, Texas for $9.3 million. In January 2016, we entered into a definitive agreement to purchase the stock of Tennis Channel for $350.0 million. The transaction is expected to close in the first quarter 2016, subject to anti-trust approval, and other customary closing conditions. In February 2016, we announced a $500,000 broadcast diversity scholarship fund to help minority students finance their undergraduate studies related to television broadcasting or journalism. In February 2016, we completed the acquisition of the broadcast assets of WSBT (CBS) in South Bend-Elkhart, Indiana, owned by Schurz Communications, Inc., and sold the broadcast assets of WLUC (NBC and FOX) in Marquette, Michigan to Gray Television, Inc. In February 2016, our Board of Directors declared a quarterly dividend of $0.165 per share, payable on March 18, 2016 to the holders of record at the close of business on March 7, 2016. Political spending is significantly higher in the even-number years due to the cyclicality of political elections. In addition, every four years, political spending is typically elevated further due to the advertising related to the presidential election. The FCC has permitted broadcast television stations to use their digital spectrum for a wide variety of services including multi-channel broadcasts. The FCC “must-carry” rules only apply to a station’s primary digital stream. Retransmission consent rules provide a mechanism for broadcasters to seek payment from MVPDs who carry broadcasters’ signals. Recognition of the value of the programming content provided by broadcasters, including local news and other programming and network programming all in HD has generated increased local revenues. Many broadcasters are enhancing / upgrading their websites to use the internet to deliver rich media content, such as newscasts and weather updates, to attract advertisers and to compete with other internet sites and smart phone and tablet device applications and other social media outlets. Seasonal advertising increases occur in the second and fourth quarters due to the anticipation of certain seasonal and holiday spending by consumers. Broadcasters have found ways to increase returns on their news programming initiatives while continuing to maintain locally produced content through the use of news sharing arrangements. Advertising revenue related to the Olympics occurs in even numbered years and the Super Bowl is aired on a different network each year. Both of these popularly viewed events can have an impact on our advertising revenues. Our operating revenues are derived from local and national advertisers and, to a much lesser extent, from political advertisers and digital platforms. We also generate local revenues from our retransmission consent agreements with MVPDs. Revenues from national advertisers have continued to trend downward when measured as a percentage of total broadcast revenues. We believe this trend is the result of our focus on increasing local advertising revenues as a percentage of total advertising revenues, combined with a decrease in overall spending by advertisers transacted through our rep firm and an increase in the number of competitive media outlets providing national advertisers multiple alternatives in which to advertise their goods or services. Our efforts to mitigate the effect of these increasingly competitive media outlets for national advertisers include continuing our efforts to increase local revenues and developing innovative sales and marketing strategies to sell traditional and non-traditional services to our advertisers including the success of multi-channel digital initiatives together with mobile DTV. In addition, our revenue success is dependent on the success and advertising spending levels of the automotive industry. This discussion and analysis of our financial condition and results of operations is based on our consolidated financial statements which have been prepared in accordance with accounting principles generally accepted in the United States. The preparation of these financial statements requires us to make estimates and judgments that affect the reported amount of assets, liabilities, revenues and expenses and related disclosure of contingent assets and liabilities. On an on-going basis, we evaluate our estimates including those related to goodwill and intangible assets, program contract costs, and income taxes. We base our estimates on historical experience and on various other assumptions that are believed to be reasonable under the circumstances, the results of which form the basis for making judgments about the carrying values of assets and liabilities that are not readily apparent from other sources. These estimates have been consistently applied for all years presented in this report and in the past we have not experienced material differences between these estimates and actual results. However, because future events and their effects cannot be determined with certainty, actual results could differ from our estimates and such differences could be material. We consider the following accounting policies to be the most critical as they are important to our financial condition and results of operations, and require significant judgment and estimates on the part of management in their application. For a detailed discussion of the application of these and other accounting policies, see Note 1. Nature of Operations and Summary of Significant Accounting Policies within the Consolidated Financial Statements. Valuation of Goodwill and Intangible Assets. At least annually, we periodically evaluate our goodwill and broadcast licenses for potential impairment indicators. Our judgments regarding the existence of impairment indicators are based on estimated future cash flows, market conditions, operating performance of our stations, legal factors and other various qualitative factors. As of December 31, 2015, our consolidated balance sheet includes $1,931.1 million and $132.5 million of goodwill and broadcast licenses, respectively, related to our Broadcast segment. Both our annual goodwill and broadcast license impairment assessments begin with qualitatively assessing whether it is more-likely-than-not that the respective asset has been impaired. If we conclude that it is more-likely-than-not that a reporting unit or broadcast license is impaired, we apply the quantitative assessment, which involves comparing the estimated fair value of the reporting unit or broadcast license to its respective carrying value. See Impairment of Goodwill, Intangibles and Other Long-Lived Assets within Note 1. Nature of Operations and Summary of Significant Accounting Policies within the Consolidated Statement of Operations for further discussion of the significant judgments and estimates inherent in both qualitatively assessing whether impairment may exist and estimating the fair values of the reporting units and broadcast licenses. See Note 6. Goodwill, Broadcast Licenses and Other Intangible Assets within the Consolidated Financial Statements for the results of our annual impairment tests during the years ended December 31, 2015, 2014 and 2013. For our annual goodwill impairment tests in 2015, 2014 and 2013, we concluded that it was more-likely-than-not that goodwill was not impaired based on our qualitative assessments. For our annual impairment tests for broadcast licenses in both 2015, 2014, and 2013, we concluded that it was more-likely-than-not that broadcast licenses were not impaired based on our qualitative assessments, except for broadcast licenses with an aggregate carrying value of $15.3 million in 2015 and $39.3 million in 2014 for which we performed the quantitative assessments. During 2014 we recorded $3.2 million of impairment, which was recorded in amortization of definite-lived intangibles and other assets in our consolidated statement of operations, primarily as a result of declines in projected future market revenues related to the radio broadcast licenses. During 2015, the results of our quantitative tests of broadcast licenses indicated that the aggregate fair values of those licenses exceeds the respective carrying values by approximately 30%. We believe we have made reasonable estimates and utilized appropriate assumptions to evaluate whether it was more likely than not that the fair values of our reporting units and broadcast licenses were less than their carrying values. If future results are not consistent with our assumptions and estimates, including future events such as a deterioration of market conditions or significant increases in discount rates, we could be exposed to impairment charges in the future. Any resulting impairment loss could have a material adverse impact on our consolidated balance sheets, consolidated statements of operations and consolidated statements of cash flows. for these costs, which is dependent on the economic benefit expected to be generated from the program and may significantly differ from the timing of related payments under the contractual obligation. If our estimates of future advertising revenues decline, amortization expense could be accelerated or NRV adjustments may be required. Income Tax. As discussed under Income Taxes within Note 1. Nature of Operations and Summary of Significant Accounting Policies within the Consolidated Financial Statements, we recognize deferred tax assets and liabilities based on the differences between the financial statement carrying amounts and the tax bases of assets and liabilities. We provide a valuation allowance for deferred tax assets if we determine that it is more likely than not that some or all of the deferred tax assets will not be realized. In evaluating our ability to realize net deferred tax assets, we consider all available evidence, both positive and negative, including our past operating results, tax planning strategies and forecasts of future taxable income. In considering these sources of taxable income, we must make certain judgments that are based on the plans and estimates used to manage our underlying businesses on a long-term basis. As of December 31, 2015 and 2014, a valuation allowance has been provided for deferred tax assets related to a substantial amount of our available state net operating loss carryforwards based on past operating results, expected timing of the reversals of existing temporary book/tax basis differences, alternative tax strategies and projected future taxable income. Future changes in operating and/or taxable income or other changes in facts and circumstances could significantly impact the ability to realize our deferred tax assets which could have a material effect on our consolidated financial statements. Management periodically performs a comprehensive review of our tax positions and we record a liability for unrecognized tax benefits when such tax positions do not meet the “more-likely-than-not” threshold. Significant judgment is required in determining whether a tax position meets the “more-likely-than-not” threshold, and it is based on a variety of facts and circumstances, including interpretation of the relevant federal and state income tax codes, regulations, case law and other authoritative pronouncements. Based on this analysis, the status of ongoing audits and the expiration of applicable statute of limitations, liabilities are adjusted as necessary. The resolution of audits is unpredictable and could result in tax liabilities that are significantly higher or lower than for what we have provided. See Note 10. Income Taxes within the Consolidated Financial Statements, for further discussion of accrued unrecognized tax benefits. Variable Interest Entities. As discussed under Variable Interest Entities within Note 1. Nature of Operations and Summary of Significant Accounting Policies within the Consolidated Financial Statements, we have determined that certain third-party licensees of stations for which we perform services to pursuant to arrangements, including LMAs and JSAs/SSAs, are VIEs and we are the primary beneficiary of those variable interests because, subject to the ultimate control of the licensees, we have the power to direct the activities which significantly impact the economic performance of the VIE through the services we provide and because we absorb losses and returns that would be considered significant to the VIEs. Determining whether the an entity is a VIE and whether we are the primary beneficiary of the variable interests requires judgment which is based on quantitative and qualitative factors that indicate whether or not we are absorbing a majority of the entity’s economic risks or receiving a majority of the entity’s economic rewards, based on the terms of the arrangements with the entity. See Recent Accounting Pronouncements within Note 1. Nature of Operations and Summary of Significant Accounting Policies within the Consolidated Financial Statements for discussion on recent accounting policies and impact our financial statements. In general, this discussion is related to the results of our continuing operations, except for discussions regarding our cash flows, which also include the results of our discontinued operations. The results of the acquired stations during the years ended 2013, 2014, and 2015 are included in our results of our continuing operations for the years ended 2013, 2014, and 2015 from their respective dates of acquisition. See Note 2. Acquisitions within the Consolidated Financial Statements for further discussion of stations acquired. Additionally, the results of certain television stations that were sold and classified as discontinued operations are not included in our results of our continuing operations for the period. See Discontinued Operations under Note 3. Disposition of Assets and Discontinued Operations within the Consolidated Financial Statements for further discussion of excluded stations. Unless otherwise indicated, references in this discussion and analysis to 2015, 2014 and 2013 are to our fiscal years ended December 31, 2015, 2014 and 2013, respectively. Additionally, any references to the first, second, third or fourth quarters are to the three months ended March 31, June 30, September 30 and December 31, respectively, for the year being discussed. We have one reportable segment, “broadcast” that is disclosed separately from our other and corporate activities. Our operating results are usually subject to seasonal fluctuations. Usually, the second and fourth quarter operating results are higher than the first and third quarters’ because advertising expenditures are increased in anticipation of certain seasonal and holiday spending by consumers. Our operating results are usually subject to fluctuations from political advertising. In even numbered years, political spending is usually significantly higher than in odd numbered years due to advertising expenditures preceding local and national elections. Additionally, every four years, political spending is usually elevated further due to advertising expenditures preceding the presidential election. The following table sets forth certain of our operating data from continuing operations for the years ended December 31, 2015, 2014 and 2013 (in millions). For definitions of terms, see the footnotes to the table in Item 6. Selected Financial Data. Political revenue is not comparable from year to year due to the cyclicality of elections. See Political Revenues below for more information. Our largest categories of advertising and their approximate percentages of 2015 net time sales, which include the advertising portion of our local and national broadcast revenues, were automotive (25.5%), services (16.7%), medical (6.9%), retail/department stores (5.7%), and furniture (5.2%). No other advertising category accounted for more than 5.0% of our net time sales in 2015. No advertiser accounted for more than 0.8% of our consolidated revenue in 2015. We conduct business with thousands of advertisers. Our primary types of programming and their approximate percentages of 2015 net time sales were local news (29.6%), syndicated programming (29.3%), network programming (28.8%), sports programming (8.3%), direct advertising programming (3.8%) and kids (0.2%). See Television Markets and Stations within Item 1. Business for further channel details. We have acquired a significant number of television stations during 2015, 2014, and 2013, with a variety of network affiliations. This acquisition activity affects the year-over-year comparability of revenue by affiliation. See Note 2. Acquisitions within the Consolidated Financial Statements for further discussion of stations acquired. We broadcast other programming from the following providers on our channels including: Antenna TV, Azteca, Bounce Network, COMET, Decades, Estrella TV, Get TV, Grit, Heartland, Me TV, MundoFox, Retro TV, Telemundo, This TV, News & Weather, Univision and Zuus Country. Media Revenues. Media revenues increased $224.2 million in 2015 when compared to 2014, of which $220.5 million was related to stations not included in the same period in 2014. The remaining increase was due to an increase in retransmission revenues from MVPD and increases in advertising revenues generated from the services, medical, and furniture sectors. These increases were partially offset by a decrease in advertising revenues generated from the political, schools, and fast food sectors. Excluding the stations acquired in 2015, automotive, which typically is our largest category, represented 25.5% of net time sales for the year ended December 31, 2015. Media revenues increased $565.0 million in 2014 when compared to 2013, of which $457.9 million was related to stations not included in the same period in 2014. The remaining increase was due to an increase in retransmission revenues from MVPD and increases in advertising revenues generated from the political, medical and furniture sectors. These increases were partially offset by a decrease in advertising revenues generated from the direct response, retail-department stores, and restaurants-other sectors. Excluding the stations acquired in 2014, automotive, which typically is our largest category, represented 22.7% of net time sales for the year ended December 31, 2014. Political Revenues. Political revenues, which include time sales from political advertising, decreased by $106.0 million to $25.8 million for 2015 when compared to 2014. Political revenues increased by $120.0 million to $131.8 million for 2014 when compared to 2013. Political revenues are typically higher in election years such as 2014. Accordingly, we expect political revenues to increase significantly in 2016, a presidential election year, from 2015 levels. Local Revenues. Excluding political revenues, our local media revenues, which include local times sales, retransmission revenues, digital, and other local revenues, were up $286.1 million for 2015 when compared to 2014, of which $176.7 million was related to the stations not included in the same period in 2014. The remaining increase is due to an increase in advertising spending particularly in the entertainment, direct response, and home products sectors and an increase in retransmission revenues from MVPDs. These increases were partially offset by a decrease due to a decline in advertising revenues from the automotive, fast food, and schools sectors. Excluding political revenues, our local media revenues were up $387.0 million for 2014 when compared to 2013, of which $345.0 million related to the stations acquired in 2014. The remaining increase is due to an increase in advertising spending particularly in the medical, religion, and home products sectors and an increase in retransmission revenues from MVPDs. These increases were partially offset by a decrease due to a decline in advertising revenues from the schools, direct response and fast food sectors. National Revenues. Our national media revenues, excluding political revenues, which include national time sales and other national revenues, were up $44.1 million for 2015 when compared to 2014, of which $44.1 million was related to the stations not included in the same period in 2014. The remaining increase was due to an increase in advertising revenues generated from the pharmaceutical/cosmetics, retail/department stores, and furniture sectors. These increases were partially offset by a decrease in advertising revenues in the telecommunications, paid programs, and automotive sectors. Excluding political revenues, our national media revenues increased $58.0 million for 2014 when compared to 2013, of which $77.7 million related to the stations acquired in 2014. The remaining decrease was due to decreases in advertising revenues generated from the direct response, automotive, and food-grocery/other sectors. These decreases were partially offset by an increase in advertising revenues in the services, schools and pharmaceutical/cosmetics sectors.